We live in a world that tells us that we NEED to have two incomes for a family to live well. However, this simply isn’t true – not even one bit! Think about it. Up until a few decades ago, almost every single household lived on one income. The man worked outside the home, while the woman stayed at home, raising the babies and taking care of the household. How did they do it? And what has changed so much in the past few decades? One of the main things that has changed is our mindset. Many of us don’t know how to differentiate a “want” from a genuine “need”. We want that newer vehicle and the larger home, but we don’t need them. We want to eat out at restaurants several times a week and buy new clothes for our family, but we don’t actually need to. Modern-day marketing and advertising is BRILLIANT at making people feel like they need a certain product or service. And often, to your own detriment, you end up purchasing it with your hard-earned money or by putting it on a credit card. This is the beginning of a life full of debt, bills, and living paycheck-to-paycheck. If you want to learn how to live frugally, on one income, read the 11 finance tips below. If you decide to live on one income, do whatever it takes to create an emergency fund. An emergency fund is a huge source of security for you and your family. It is an absolute necessity! Unexpected expenses, unemployment, and sickness are very normal parts of life. You must be prepared for them. Ideally, an emergency fund should be enough to pay 3-6 months’ worth of expenses. Try to save at least 10% of each paycheck until you reach your goal. Occasionally, add extra to your emergency fund to accelerate the process. Put your tax return into the fund and cut back on monthly expenses. If you find yourself in unfortunate circumstances, you have two choices. You can either fall back on your emergency fund or get into credit card debt. No, it isn’t easy! And of course it is difficult to take something out of your shopping cart and put it back on the shelf. However, if you want to live on one income, it is a huge necessity! You must learn to differentiate a “want” from a “need”. Right now, at this moment, I have four items in my Amazon.com shopping cart that have been sitting there for 2 months. I really want to buy them and they would be very useful, but I don’t absolutely need them. The #1 reason people get into credit card debt is because they wanted something before they could afford it. Pro Tip: Always eat a satisfying meal before going grocery shopping! When you shop on an empty stomach, you are way more likely to purchase unnecessary and unhealthy food items that you didn’t need. Let me preface this with the following statement: If you are irresponsible with money and tend towards heavy spending, DO NOT have a credit card. Although credit cards can be an amazing tool to earn financial rewards, they can also financially destroy you. However, credit cards can play a vital role in helping you save money, earn rewards, and build your credit. I make 100% of my purchases using credit cards, but I never spend more than I can pay off at the end of each month. (I have never paid interest on any of my cards – this is KEY!). By making all my purchases on the cards, I have earned thousands of credit card points and been able to pay for almost all of my vacations with my rewards and cash back. Pro Tip: Find a credit card that works for you and your lifestyle. A few common types of credit cards include the following: cash back, reward points, hotel and travel points, retail rewards, gas points, airline miles, etc. Car insurance, cable, cellphone plans, internet, car mechanic, etc. Shopping around for deals always takes some extra work, but it will save you thousands of dollars! Read about our experience here. Several months ago, I was looking for a trusted mechanic. I found a shop with great reviews and a welcoming staff. However, after doing some price comparisons, their estimate was $800 more than another trusted mechanic across town. Moral of the story: always do the extra work and shop around! When it comes to car insurance, insurance companies have a bad habit of increasing your rates even when you have a perfect driving record. Every 6 months, research insurance rates with competitors! You will almost always find a better deal. As for cellphone plans, don’t even get me started! I have friends who pay an outrageous amount per month because they are in a contract or believe they are loyal to a brand. With so many discount cell services out there, there are countless options for a more cost-effective route. Always do your homework when it comes to these types of services. You can almost always find a better deal! Anyone can create a budget! But not everyone sticks to it. To create a budget, all you need to know is the amount of money you make per month and the amount of money you spend per month. To help track your expenses, I highly recommend using Mint, Personal Capital, and Every Dollar (Dave Ramsey). All of these apps will track your digital spending from your credit and debit cards. All you need to do is input all the data and credit/debit card information – then the app will start to track your budget by itself. Don’t forget to input any purchases you made in cash. We all need a break once in a while! However, we sometimes underestimate the financial side of the getaway. Food, hotel, airfare, gas, rental car, entertainment, etc. Expenses accumulate very quickly, often adding up to much more than we previously anticipated. There are some incredibly valuable ways to cut costs when it come to vacations! You can earn free money to designate to your travel fund, find amazing hotel deals, and travel during low-tourist seasons. Read about the 9 things we do to take incredibly affordable vacations here. OK – not everything…but you know what I mean. Don’t fall for the big, fat lie that says, “You can have it all now!” Sure, you can buy the trendiest items right now, but you will pay for it later. Let’s be serious. You do not need brand new furniture, a new car, a new house, an in-ground pool, and new appliances. All of that will come in time – as you make wise financial decisions and work hard towards your financial goals. Even when you can technically afford brand-new things, you can still opt for the second-hand route! We do! Take a look through Facebook Marketplace and Craigslist. Also, almost every town has an online community for people to post second-hand goods. We have bought every single piece of furniture in our home second-hand: couches, beds, dressers, TV stand, kitchen table & chairs, fridge, dishwasher, stove, desk, lamps, piano, etc. Virtually everything in our home is second hand – except our mattresses because that is one of our pet peeves. WE HAVE SAVED THOUSANDS OF DOLLARS! You can always get “the look” for a fraction of the price if you choose to do a little extra work. …here comes the hard part. If you want to live on one income, you are going to have to learn to make some personal sacrifices. Maybe, at one point, you could go out shopping whenever you wanted and eat out several times a week. Perhaps you’ve always driven the nicest vehicles, worn the trendiest clothes, and got your hair colored every few weeks. Or maybe you LOVE your Starbucks coffee every morning. 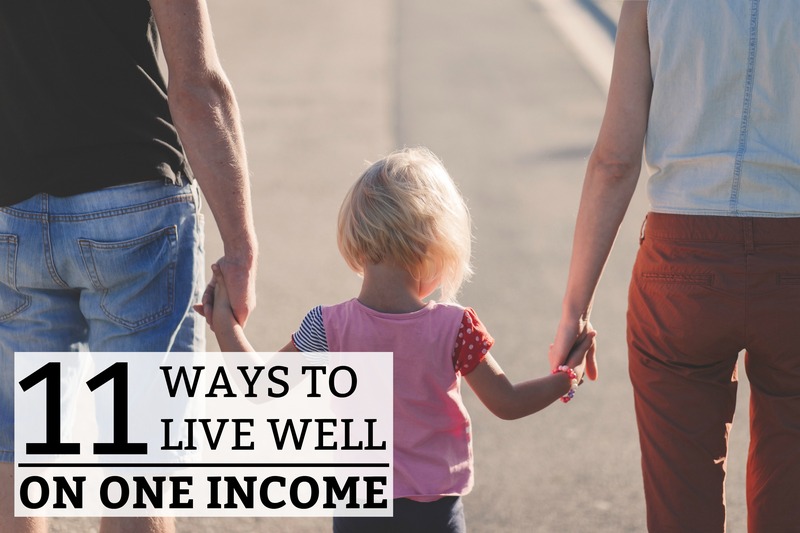 Choosing to live on one income means that you will have to learn to live without some of these things. You will probably have to drive an older vehicle, find new ways to wear your old clothes, go out to eat less, make your coffee at home, take fewer and shorter vacations, search for free entertainment, and plan for anything that is not an absolute necessity. Just know that in the end, happiness is a choice! You can turn these sacrifices into a challenge and try to find the best ways to enjoy life, while spending less. Money is famous for being one of the main things couples argue about. Sadly, many times it is the cause for divorce. To make a financial plan work, both spouses must be in agreement over how money will be spent and saved. Take some time to sit down and go over the finances! Talk through your frustrations and expectations. If one spouse is more money-savvy, this does not excuse the other spouse from knowing how to take care of the bills, budget, save, and know how much is in their accounts. Imagine how difficult it would be if there was a family emergency and the other spouse had no idea how to take care of any of the finances. It is CRITICAL for you to create a secured document that lists all your bills, accounts, and passwords. Most households have quite a number of bills to pay each month: electricity, water, cellphone, internet, cable, credit card, etc. Both spouses need to be aware of how to access and pay each bill, so there isn’t any additional stress if there is an emergency. Every couple needs to have some fun money! Without it, you may start to feel restricted, which eventually grows into resentment. It doesn’t have to be much, but it does have to be an amount that you both agree on and have included in your monthly budget. This amount can be spent on anything you want and you don’t have to consult each other. This will help you not to feel the pressure of being under the financial restrictions of living on one income. The main reason I say this is because a side hustle is a great way for you to keep your job-skills updated, while saving for a vacation, retirement, or something you simply want that isn’t in the budget. This was the main reason we started this blog! We wanted to bring in a side income, while pursuing our careers in Corporate America. Blogging can be a lucrative endeavor if you are willing to put in the effort! I won’t go into too much detail about this, but we did write a post about a few of the side hustles we use to save money. Don’t let something that you have a gift for go to waste! If you love flipping furniture, taking pictures, doing hair and makeup, or babysitting – start using your talents to make some cash! And don’t be hesitant to invest in yourself. If you need to purchase a program or take a course on how to improve your skills at something, by all means go for it! Sometimes, you have to spend a little money (invest in yourself), so you can make some money. At the end of the day, it all starts with a plan! If you can, create a plan before one of you quits their job. However, if you are currently living on one income, you will need to get serious about creating a budget! From there, you can start implementing the tips listed above! Thanks for sharing! It takes discipline and diligence but it is valuable for families! You are welcome, Suzanne! Yes, it does take a lot of discipline and a set plan. It has made a big difference in our lives! This was a good read! I love Facebook garage sale sites because you can find specific things online and not waste timing scouring thrift stores or garage sales with kids in tow. Thank-you, Vanessa! I completely agree with you – not a big fan of scouring thrift stores either! Online is so much more convenient.